HIDETAKA NISHIYAMA - 'The Tradition Continues'. By Kenny Taylor. Bag Training - How Important is it?By John Cheetham. Training in Japan. 'A Shodan's View'. By Arwin Mahindraker. Kumite Training. Talking to Hitoshi Kasuya. By Mike Clarke. Funakoshi's Niju Kun 18. 'The Way I see It'. By Teruyuki Okazaki. Robin Rielly 'an American Traditionalist'. By Simon Lailey. 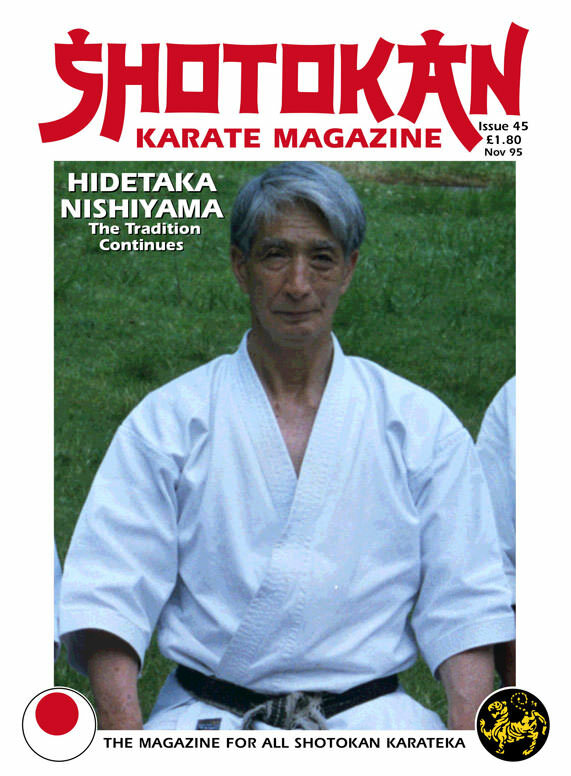 The last issue for 1995 and how better to finish the year than with an 'exclusive' interview with probably the most famous of all the great living Shotokan Masters, Shihan Hidetaka Nishiyama 9th Dan, one of the most senior teachers of Traditional Karate-Do in the world. 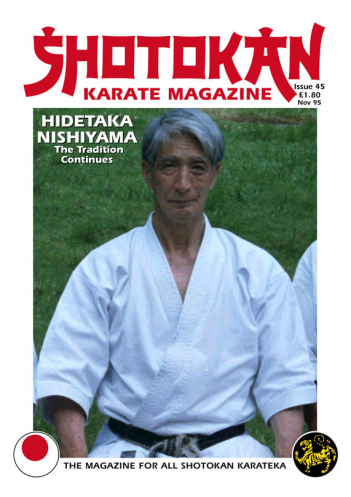 This is a marvellous interview as was the interview in the last issue with Master Okazaki. Read what Master Nishiyama says about where he thinks the J.K.A. went wrong when they originally sent their professional instructors to countries all over the world. Some very honest statements are made by this most important figure from the world of Shotokan Karate. When he says that these original instructors were 'too strict', it must be remembered that the Japan of 30/35 years ago was very different to the Japan of today which is far, far more westernised. In those days there was no room or place for 'democracy' in the traditional 'Kohai/Sempai' system. The senior had the say in 'everything' with the junior being the bag-carrier. Even in some Japanese universities today, the first and second year students are given a 'dogs life' from the more senior third and fourth year students, where the original Kohai/Sempai order still exists. So, when Master Nishiyama says that the instructors were possibly 'too strict', I don't think he just means in terms of hard training but the very fundamental difference between the East and West and maybe this could have been the reason that many Western students did not stay with the Japanese Sensei's when they first introduced karate to the outsideworld in the late 1950's and early 1960's. Master Nishiyama's explanation of the importance of KATA within Traditional Karate is positively educational and one particular statement is worth thinking about... "Karate is an ' ART' not 'science'. An 'ART' which uses 'scientific'' principles." Obviously, I have read this interview over and over and everytime I pick-up on something else, there is so much experience and knowledge contained here that one quick read is definitely not enough. Thanks to Kenny Taylor (Scotland) who did the interview in California (June 95), The questions were devised by myself. We also have a great article by Master Okazaki in this edition talking about Kata and so many points tie in with Master Nishiyama's words. News on the Shotokan grapevine suggests that these two most senior Sensei's are once again communicating with each other and we may possibly see members from both organisations competing together. Good news! 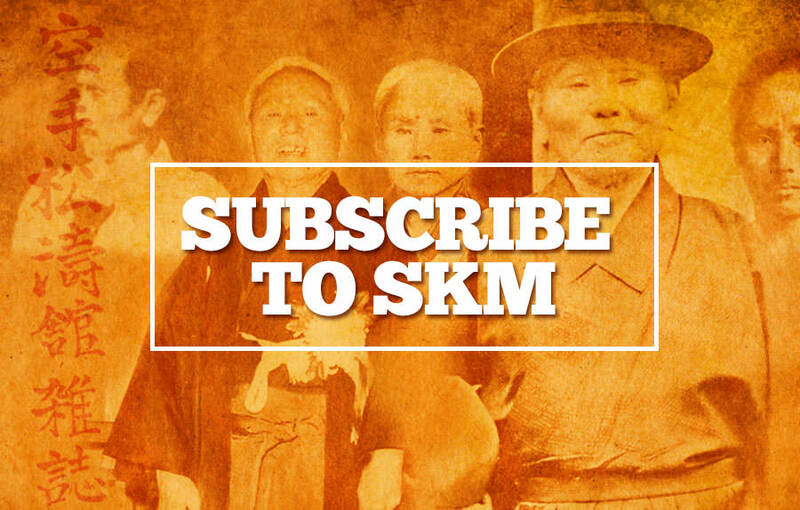 Let's get 'ALL' Shotokan together! In total contrast to Master Nishiyama's interview, the article on Robin Rielly is more like a 'story' of one man's search for karate, when karate was virtually unknown outside of Japan. I personally enjoyed this honest little tale and I'm sure you will. Good reading and Good training. Editor. "BAG TRAINING" HOW IMPORTANT IS IT FOR TRADITIONAL KARATEKA?By John Cheetham. Sensei Masao Kagawa demonstrates 'bag training' at Dennis Tilley's Manchester UK. dojo (1992). If you ask any top karate instructor the question, "How important is 'Bag-training' for Traditional karateka? "....you can bet your life that their answer will be the same. "Very important." Some would say, "Vitally important." If you look at the photograph accompanying the article and think that the person kicking the bag is without a doubt one of the best karate 'Technicians' in the world, namely Sensei Masao Kagawa 6th Dan J.K.A. Sensei Kagawa's technique has been described as 'Textbook' J.K.A. Shotokan, which in turn has been described as the most 'Refined' karate ever! Yet, here he is slamming into a heavy bag and this is a very important part of Kagawa's training programme. It seems that possibly 'Bag training' was introduced into Japan with the influence of Western style Boxing in the early 1900's. Probably around 1910/15 when American fighters first visited Japan. From that time the Japanese have been massive followers of Western Boxing. The Karate of the Okinawans was, as we know, more Makiwara based and all kicks were below the waist. It appears that Master Funakoshi's son (Yoshitaka) was a pioneer where 'Bag training' was concerned and some say that he favoured the bag over the makiwara. He used a very heavy sand filled bag, which he would kick-strike and punch with tremendous force and impact. Apparently he wasn't too interested in weight training as were the older Okinawan karateka who came to Japan but he did a considerable amount of work on the bag to develop his awesome power, as opposed to strength training. If you have ever done Bag training you will know for sure that many times your technique will be far removed from the way your techniques feel, done in fresh air, night after night at the dojo. The whole fist is absorbed on impact as opposed to the first two knuckles (seiken) when practicing on a makiwara. You can get a student who is technically superb, stick him or her on a 'bag' for the first time and they can't do a thing! They are on new territory. It is a different ball game altogether. That alone is proof enough to suggest that 'bag training' probably more than any other supplementary training, should be an important part of any serious karate-ka's training regime, male or female. With the increasing number of ladies taking up karate, training on a bag, it has to be said, is a realistic option for ladies to develop their technique on. It allows them to strengthen their wrists/fists, whereas I've heard many ladies say that the makiwara is too harsh, too severe for them. Women should do bag work for the same reasons as men, that is;- increasing power in their techniques, actually impacting, applying techniques and also stamina training. There is the argument from the softer Chinese styles who favour speed and accuracy striking to vital areas, over power techniques, as they don't believe power training to be necessary. But this softer aspect is also advocated in Traditional karate and appears in numerous techniques contained in our Kata. However, if speed and accuracy fail and you don't have powerful techniques then you have a problem! You will quite simply be 'overpowered'. We need both, hard and soft. Bag training is for 'power'. Probably like many other students of Traditional karate, after about the first ten years of training, I thought I'd have a look at, and possibly try, another martial art, as well as Shotokan karate. I had a look at Ju-jitsu which in all honesty, at the time, seemed to me to be too pre-arranged:- if they do this, then you do that, etc., and they seemed to practice in such a way that one person threw a 'slow' or 'medium' speed punch and the other reacted with lightning speed and tied them in a knot!! I thought, well, what if it had been a 'fast' punch in the first place?? So, I looked elsewhere. Fortunately I was introduced to Thai Boxing and a great instructor, Master Toddy who was then based in Manchester, England. (This was around 1980). He was to be a revelation. I remember going along to the first class thinking 'Oh, well I'm 2nd Dan in karate, I've done my makiwara work, weights, etc',...What a shock! He watched me do a couple of combinations and said "Oh! Technique O.K. but I think need bag practice." He stuck me infront of a very heavy and awesome looking bag and said,..."Do same combination on bag." I think I'd done a typical Dan-grade exam combination, e.g. Kizami zuki - gyaku zuki - mawashi geri - uraken - gyaku zuki. Or something very similar. What a disaster! I realised in that one moment that having reasonable technique and power (I'd been doing quite a lot of weight training) did not mean a light when it came to actually applying your techniques on a moving object, namely, this unfriendly, stuffed piece of leather! I went away from that first session asking some serious questions about karate. Then I realised that it wasn't karate that was the problem, it was simply me not having 'bag' experience and knowing how to 'apply' karate techniques to the bag. Like everything in karate and in life, you are only good at what you practice! You can do every conceivable technique on a bag which you cannot do on a makiwara. Knees, head, everything is possible, (I suppose you could bite it if you were so inclined!!). Joking apart, 'Bag training' should be high on your 'personal' training agenda. I say 'personal', meaning if you go to a dojo and train say, three times a week in Traditional Shotokan or whatever style, where you are doing good technique practice and learning about timing and distance through various kinds of partner work, then you need some 'homework' which is going to be of similar benefit but with a different slant or angle. Bag training is fantastic for fitness, power, distance and timing, probably more so than any other piece of related karate equipment. Your techniques may not be as perfect or look as good as they do or feel in fresh air but all the top instructors say, "Don't worry about that." Use the bag for what it is. It is a 'gut- basic' piece of training equipment that will forge powerful and meaningful techniques and is great for conditioning the body. An interesting point was brought up in a conversation with a friend of mine recently. Frank Cope 6th Dan is one of the most experienced karate-ka in Europe and someone who I feel understands karate in considerable depth. (We had a great technical interview with Frank in issue 38 of SKM). Frank told me he has been doing a lot of bag training recently with his sons at a boxing club. The boxing coach was watching Frank hitting the bag and said to him, "Get up on your toes more Frank." Now, an interesting technical point was introduced. Frank told me that he disagreed with the coach's suggestion. Frank said he felt his best most powerful and penetrating punch was when his feet were firmly planted on the floor in the classic 'rooted' stance that we practice continuously in traditional karate. As if you are an extension of the floor, the opposite of being up on your toes and throwing yourself at the bag as suggested by the boxing coach. This is relying 'totally' on throwing your weight into the blow. There's food for thought in those two little points, well worth examining! There is a terrible temptation when 'bag training', to just hurl yourself at the bag and forget all about your actual technique! It's quite a natural reaction. The best thing to do is experiment for yourself but if you have not tried bag training or have not done it for a while, there is nothing quite like it. It saps the strength and energy like no other training. It makes you realise how well conditioned boxers are. Even many Traditional dojo's advocate 'Bag training' over the more conventional 'Makiwara' practice for the very reason that they say, that a more wide variety of techniques can be used and the bag has a closer resemblance to the feel of a human body, plus it moves!! I know that some of the toughest dojo's in this country prefer bag-work to makiwara practice. 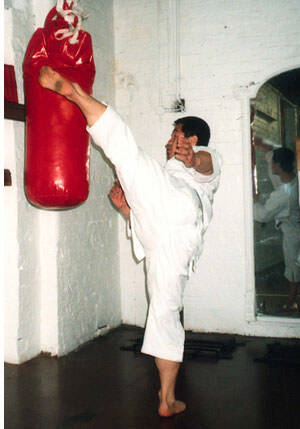 For instance the famous Liverpool Red Triangle, the home of many famous Shotokan Instructors, use Bag training. This is not an anti-makiwara article by the way! There are endless training methods used for bag-work but some of the more conventional are field tested and you can't go wrong with these. Try punching and kicking the bag flat out for two or three minutes!! Then try what the Thai boxers do and grab the bag and use knee attacks (front and round), alternating knees, for two or three minutes. Then a combination of punching, kicking, knees and elbows for a couple more two/three minute rounds. This is great stamina training and even if your technique does 'go up the wall', so what! In a real situation you would have to do what you can and this type of training is probably more beneficial than many others when it really comes down to it. Some say only use boxing type punches on a bag whereas others say no, keep your form and try and do the karate punching technique or as near as possible to the principles and techniques. 'Experiment' and see! Keep up your class practice and basic technique practice, it is most important but do try some bag training every so often, to make sense out of all your hard work. Obviously it's important to try and maintain good form and correct technique at all times but when you are very tired this is virtually impossible and you need that extra 'something' which bag-work can help develop. It may be worth thinking about one point with regard to 'how' karateka should train on the bag, and that is that we are not trying to build up a 'points' victory (as with Boxers, Thai boxers, Kick-boxers, etc) who hope to either get lucky with a knock-out punch or wear the opponent down or win on points etc. Our aim with Traditional karate practice is the 'one finishing blow' concept. So, we should train accordingly. It's no good just doing a meaningless series of light left jabs followed by a big right hand 'hay-maker'.That is sport orientated. So, this would mean that with a karateka's training on the bag, every single shot you throw at the bag whether it's a kick - punch - strike or whatever, has the intention and concept of the knock-out blow, the one 'finishing' technique. Of course, we must also practice combinations; kick-punch, kick-strike, knee-elbow etc., but I think the whole 'concept' of Traditional karate training is somewhat different to Sport-Karate. Quite a lot of older Traditional karateka enjoy and also feel that a combination of Kata practice and 'Bag-training' are sufficient for their own personal training or Kata and Makiwara. I remember some good advice from a very senior Shotokan Instructor when he said that a students dojo training should be for technique - spirit - skill and learning how to interact with an opponent. But your own personal training should be for fitness/strength and learning how to actually apply your dojo practice via a variety of impact devices. He did say that out of all the possible pieces of equipment available that if he could only use one, it would be the 'bag'.